Immanuel Mennonite Church, Harrisonburg, Virginia, 2012. Photo by Jennifer Bolander; used with permission. 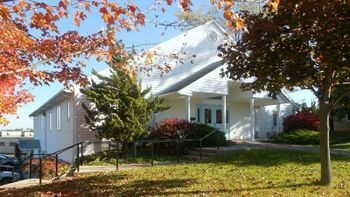 Immanuel Mennonite Church (Mennonite Church USA) in Harrisonburg, Virginia began in the fall of 1991 when a group left Broad Street Mennonite Church over differences in Christology and began a Bible study. In December they chose the name Immanuel and called Sara Wenger Shenk as pastor. The congregation met in several different locations before acquiring property and building a new structure after receiving a large donation from a young woman’s court settlement as a result of the mistreatment of her terminal disease. The church was intentional about being multicultural and situated itself in the racially mixed Northeast neighborhood of Harrisonburg. Their building sits on the site of the former segregated black swimming pool which had been abandoned. Before moving in, church leaders consulted with residents and asked what they needed. Their reply was "an affordable child care center." In response, Immanuel built a sliding scale child care center in their new worship facility. Bernard Martin and the Builder’s Guild, along with church members and many other volunteers, aided in the construction of the building. The first service was held in July 1994 before construction was completed. Roberta Webb Child Care Center, named for an African American educator, opened in fall 1994. In August 1995, Basil Marin, a native of Belize, arrived with his family to begin as Immanuel’s pastor while pursuing a Master of Divinity degree at Eastern Mennonite Seminary. Soon after his arrival, church attendance exceeded 200 primarily due to the seasonal attendance of Eastern Mennonite students, but such a level was not sustainable. By 2007 the church could only afford a halftime pastoral position, a model still in place in 2015. In the early years, and today, much of the church’s ministry revolved around neighborhood children. Vibrant worship has also been an Immanuel hallmark. In September 1999, Jerry Holsopple and others produced a CD and songbook of Jerry’s original worship music titled, Until Then – We Will Dance. Jerry’s music continues to be integral to Immanuel’s worship. In 2008, after a period of discernment, Immanuel embarked on a new vision to become more welcoming to its Hispanic neighbors. Carmen and Luke Schrock Hurst, former Mennonite Central Committee workers, were called to fill a halftime pastoral role. Over the next three years, the congregation attracted several young Anglo couples fluent in Spanish, but did not succeed in becoming bilingual. The church reaffirmed its multicultural vision but defined it more broadly. A "Kids’ Club" ministry was started in June 2014. In 2015 Pastor Matthew Bucher interacted with the church’s neighbors in Arabic. At that time the average attendance was 40. Carpenter, Steven P. "Immanuel Mennonite Church (Harrisonburg, Virginia, USA)." Global Anabaptist Mennonite Encyclopedia Online. December 2015. Web. 19 Apr 2019. http://gameo.org/index.php?title=Immanuel_Mennonite_Church_(Harrisonburg,_Virginia,_USA)&oldid=133555. Carpenter, Steven P. (December 2015). Immanuel Mennonite Church (Harrisonburg, Virginia, USA). Global Anabaptist Mennonite Encyclopedia Online. Retrieved 19 April 2019, from http://gameo.org/index.php?title=Immanuel_Mennonite_Church_(Harrisonburg,_Virginia,_USA)&oldid=133555. This page was last modified on 17 February 2016, at 08:23.